Welcome to Green Plastic Radiohead! Originally created and launched in 1997, Green Plastic strives to bring the latest information about Radiohead to fans across the Internet. It is run by Jonathan Percy out of Brooklyn, NY. 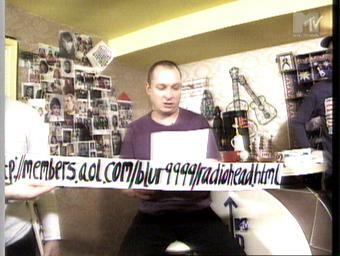 In December of 1997, Green Plastic Radiohead was featured on MTV Europe's show Up For It. The Internet was introduced to me back in 1994 and I often searched the then bland web for Radiohead lyrics, news, pictures, etc… Of course there wasn’t much around but I enjoyed sites like The Official Unofficial Radiohead Site and Tony’ s site (the very first Radiohead web page), both nonexistent today. In 1996 I started a personal web page from my AOL account with basically nothing but my own rants and raves. It really never went anywhere. This was my first experience with making a web page. On March 26, 1997, my birthday, I decided to make a little Radiohead site. Originally called A Green Plastic Radiohead Page, it had nothing more than a few links and some bad graphics. I didn’t want to make it a big site as there were plenty of great sites like Lift and Planet Telex, but this was a very exciting time as OK Computer was about to be released and there were floods of rumors on the Internet. I was caught up with this and began to spend more time adding content. It was at this time when I ditched my other site and began focusing on Green Plastic. I continued updating up until early 1998 when I moved Green Plastic Radiohead from http://members.aol.com/blur9999/radiohead.html to http://radiohead.zoonation.com. I joined Zoonation, a U2 based web sited that housed different artists and band websites. I stayed there until May 1, 1999, when I got my own domain, www.greenplastic.com. In September of 1999, I took over Ed Peer’s Radiohead site, Injektilo*, and merged it together with Green Plastic, forming a large hub for Radiohead information. Since then, Green Plastic has continued to grow to be the biggest US-based Radiohead fansite. Ed Peers, Cathy Fan, Jonathan Moore, Emma Short, Joe Grohs, Steve Merritt, Tique, Max Kolombos, Xavier Borderie, Mel and everyone at W.A.S.T.E., Caffy St Luce, Jennifer Bird, Kyle De Almeida, and of course, anyone else we have forgotten.